« To show off your High School STEM program, just take your STEM equipment to a football game! To show off your High School STEM program, just take your STEM equipment to a football game! Eric Andracke is a High School Teacher at Mahomet-Seymour High School in Mahomet, Illinois. He’s currently in his eighth year of teaching at Mahomet-Seymour, twelfth year as an educator. 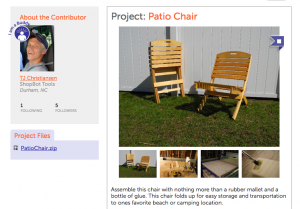 Eric teaches classes in Construction, Manufacturing, and 3D Animation. He is a graduate of Illinois State University, with degrees in Technology Education and STEM Education. 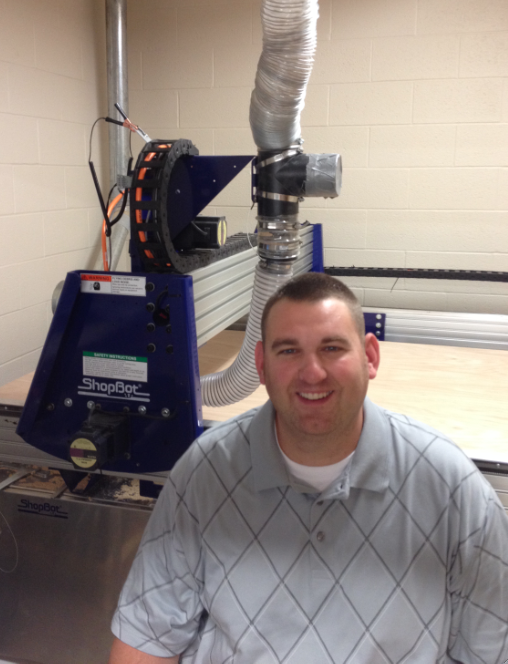 Simon Anderson, currently in his 3rd year at Mahomet-Seymour, teaches Introduction to Technology and Engineering Design. As part of their curriculum, students recently worked to build a patio chair, the files for which are found on the 100kSchools.org website. 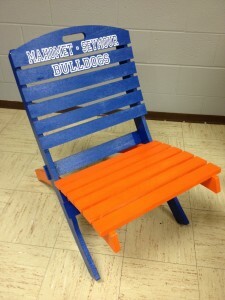 “Our objective at Mahomet-Seymour High School is to develop, teach, and promote STEM (Science, Technology, Engineering, Math) education. Within the industrial technology program, we currently focus on problem solving, engineering design, and technology education. However, we are looking to expand our program to involve and inspire students through STEM education. The integration of the four major STEM aspects of knowledge can help prepare our students for both college and career. Our expanded curriculum also contributes to the national agenda of improving the abilities of America’s youth in science and math. We plan to use digital fabrication (the continuum from digital design through digital production) as an avenue to explore STEM education at the high school level. To accomplish digital fabrication, we would like to purchase a computer numeric controlled mill called a ShopBot. With the help of this equipment, STEM education will succeed at Mahomet-Seymour High School. In most educational settings, science and math are taught independently from each other. However, STEM bridges that gap with hands-on activities, collaboration, and directive lessons. Our lessons will contain multiple learning objects that address state, national and common core learning standards. Students are also gaining a better understanding of the material since they are able to apply the knowledge to real-life activities. If you’d like tips for writing your grant applications, you’ll find useful points at the 100kSchools.org resource section. The people at ShopBot Tools also make themselves available to review your grant application and make suggestions to help you boost your case. Training at ShopBot Tools in Durham, North Carolina. Training is available in person or online. 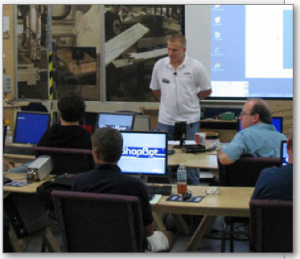 Learn more about ShopBot’s training sessions, in person and online, here. 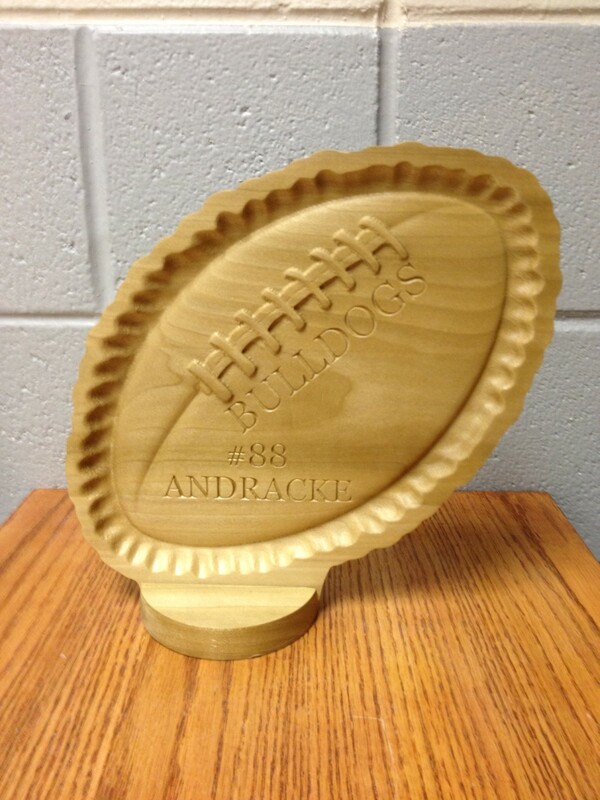 Take a look at our CNC tools here. Get in touch with ShopBot to discuss the needs of your program. Call toll-free 888-680-4466 or use this contact form.